Replica of the folding knife used in the Second World War, mainly by units of engineers and communications, with the progress of the war was very common between of all units. Made in Germany, with wooden handles. 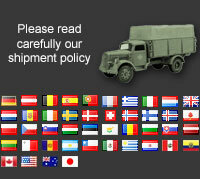 No shipments under 18 years old. Trousers worn by the Bundeswehr, with the same pattern as that used by the Kriegsmarine in World War II. Made in cotton dark blue. Reproduction of the M35 cap for NKVD Border Troops. The cap incorporates traditional Border Guard colors dating back to the 1920's, bright green crown, dark blue band and magenta piping. The visor is the squared-off fiberboard. Replica of the Officers Stiefelhose for Wehrmacht and Waffen SS, feldgrau gabardine version. Replica of the Officers Stiefelhose for Wehrmacht and Waffen SS, feldgrau wool version. Red Army Gimnasterka M35 for EM and NCO's, replica made with khaki cotton. The buttons on the chest of the tunic are covered by a strip of cloth, and there are two chest pockets either side. Red Army Gimnasterka M43 for EM and NCO's, replica made of cotton, five metal buttons. M43 Gimnasterka is the typical uniform issued to members of the Soviet Red Army during the later period of the "Great Patriotic War". Red Army Gimnasterka M43 for officers, replica made of cotton, five buttons with top pockets. M43 Gimnasterka is the typical uniform issued to members of the Soviet Red Army during the later period of the "Great Patriotic War". Read army military skirt M42 for female personel. Dark blue cotton.